Illustrations note XIX, 485 p.
In West Nile Encephalitis Virus Infection, leading scientists and researchers discuss the West Nile virus, a neurotropic flavivirus that has emerged globally as a primary cause of viral encephalitis. Its appearance in the Western Hemisphere in 1999, and the corresponding increase in global disease burden over the last decade has been accompanied by intensive study, including the entry of many scientists into the field. Breakthroughs have been made in understanding the unique transmission pattern between the vector and the multiple avian and mammalian hosts and targets. While the topics in this book are focused on the West Nile virus, they are broad in scope ranging from understanding vector transmission patterns to the dynamics of structural transitions of proteins on the surface of the virion. 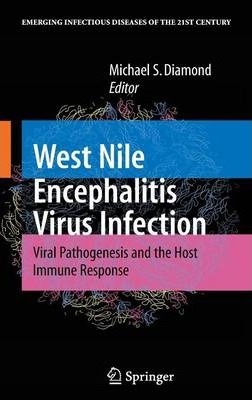 The editor and contributors of West Nile Encephalitis Virus Infection offer their expertise in this up-to-date and cutting-edge anthology, which will be of broad use to readers from a variety of backgrounds including clinical infectious disease, epidemiology, virology, immunology, and vector biology. Global Epidemiology of West Nile Virus.- West Nile Virus: Molecular Epidemiology and Diversity.- Vector Biology and West Nile Virus.- Clinical Manifestations of Neurological Disease.- Molecular Biology of West Nile Virus.- Virulence of West Nile Virus in Different Animal Hosts.- Innate immune Response and Mechanisms of Interferon Antagonism Against West Nile Virus.- Innate Immune Responses to West Nile Virus Infection.- Mechanisms of Complement Regulation of Infection by Flaviviruses.- Antibody-Mediated Neutralization of West Nile Virus: Factors that Govern Neutralization Potency.- Structural Basis of Antibody Protection Against West Nile Virus.- Molecular Mechanisms of Flaviviral Membrane Fusion.- CD4 + and CD8 + T-Cell Immune Responses in West Nile Virus Infection.- Enhanced Antigen Processing or Immune Evasion? West Nile Virus and the Induction of Immune Recognition Molecules.- Chemokines and Clearance of West Nile Virus Infection.- Persistence of West Nile Virus Infection in Vertebrates.- West Nile Virus Infection of the Central Nervous System.- The Human Antibody Response Against WNV.- Antibody Protection and Therapy for West Nile Virus Infections.- Vaccine Development Against West Nile Virus.- Novel Therapeutics Against West Nile Virus.